1975 was a magical year for Jeff Beck. Already a rock superstar from his ground breaking guitar work with The Yardbirds, Jeff Beck Group and Beck Bogert & Appice, Beck's Blow By Blow was a total artistic leap into new musical territory which netted the guitar hero massive acclaim. 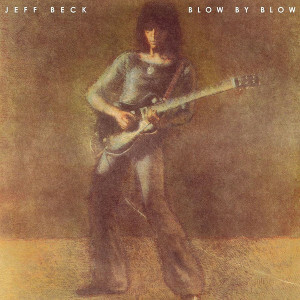 Produced by the legendary George Martin (The Beatles), Blow By Blow features nine smokin' tracks of instrumental genius as only Jeff Beck could provide. Smokin' originals like You Know What I Mean, Air Blower and Scatterbrain have all become standards in the rock/jazz fusion world, as his beautiful cover of Steve Wonder's Cause We've Ended As Lovers illustrates even further the depth, technique and originality of Jeff Beck's guitar artistry. As a nod to producer George Martin’s and Jeff Beck’s friends The Beatles, She’s A Woman broke the album wide open to a whole new generation of rock fans as the album raced to the upper rungs on the album charts worldwide. With his use of the air guitar, and funk infused back up from his band, this album truly paved the way for the rock and jazz fusion genre. With stellar musicians like Max Middleton (keyboards), Phil Chenn (bass), and Richard Bailey (drums/percussion), plus beautiful string arrangements by George Martin, Jeff Beck truly delivered a historic masterpiece with this classic album. To celebrate over four decades of this fine album, Friday Music is very pleased to announce Jeff Beck's Blow By Blow for the first time on 180 Gram Audiophile Clear Vinyl. Mastered impeccably by Joe Reagoso and pressed at RTI, this limited edition album will be one of the most important audiophile events of this year. As usual, we are also enclosing a poly bag to protect your album cover and poly sleeve to help keep your Jeff Beck vinyl in mint shape. Jeff Beck’s Blow By Blow …A history making rock album from an historic legend, an audiophile dream release……now an audiophile clear vinyl reality…From your friends at Friday Music.